The U.S. 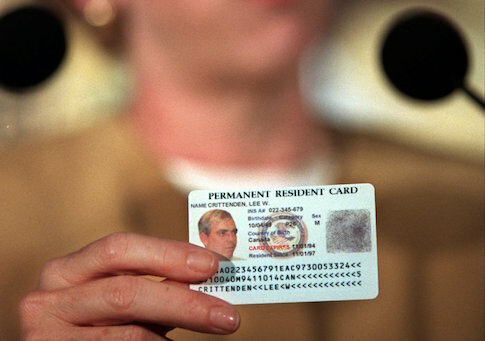 Citizenship and Immigration Services (USCIS) has issued thousands of duplicate green cards to immigrants, including many that include incorrect information and allow these individuals to stay longer than permitted in the United States, according to a new government oversight report that warns the Department of Homeland Security is incapable of tracking immigrants who may pose a security risk to the United States. USCIS, which handles immigration cases and the distribution of green cards, was found to have produced at least 19,000 green cards during the past three years that were duplicates or contained incorrect information, according to a new report by the Department of Homeland Security's inspector general. Problems at USCIS have been increasing over the past three years. The bureau has been deemed incapable of keeping track of green cards and immigrants who have overstayed their legal time in the United States. "In the wrong hands, Green Cards may enable terrorists, criminals, and illegal aliens to remain in the United States and access immigrant benefits," according to the oversight report, which disclosed that green card errors cost taxpayers $1.5 million in 2015. "Responding to card issuance errors has also resulted in additional workload and corresponding costs, as USCIS spent just under $1.5 million to address card related customer inquiries in fiscal year 2015," according to the report. Homeland security experts told the Washington Free Beacon that problems at USCIS are widespread and systemic, presenting a challenge to authorities tracking individuals who have overstayed their time in the United States or who pose a national security risk to the country. In July 2013 alone, more than 2,400 immigrants who were approved for a two-year conditional stay in the United States "were inadvertently issued cards allowing them to stay for 10 years," according to the report. Federal authorities and DHS have had difficulty locating some of the individuals who received incorrect green cards. In May 2014, at least 5,280 cards were printed "with incorrect names and/or dates of birth," the report found. "In some cases, applicants' cards were printed with ‘No Given Name' as their first name and with their first and last names combined as the last name." In March of this year, USCIS was caught sending "potentially hundreds of Green Cards to the wrong addresses" due to limitations in the bureau's filing system. The DHS inspector general found that "USCIS was unable to identify the exact number of cards sent to the incorrect addresses." Of the at least 18,000 green cards reported "missing" between January and April of this year, "95 percent were delivered as addressed," meaning the cards could have been sold on the black market or used in other inappropriate ways. "There is a huge black market demand for legal documentation such as Green Cards, which can be used by imposters to reside in the United States or access other individuals’ benefits," the report warned. U.S. Customs and Border Protection recorded at least 4,600 cases between 2013 and 2015 in which "imposter green cards" were used. The number of errors are increasing at USCIS, which experts say is overwhelmed by an immigration system that cannot handle even some of the most simple administrative tasks. "Service requests initiated by USCIS customers claiming they did not receive Green Cards have steadily increased from 44,519 in [fiscal year] 2013, to 67,247 in [fiscal] 2014, and 92,645 in [fiscal] 2015," according to the report. The director of USCIS, Leon Rodriguez, said USCIS concurred with the recommendations in the inspector general's report and would complete the implementation of the recommendations by June 2017. 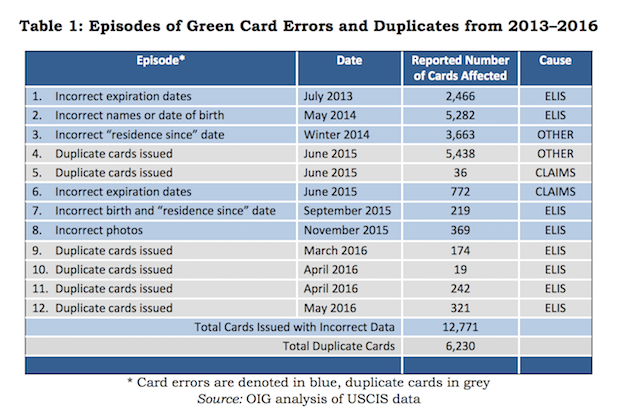 "The number of Green Cards containing errors represented a tiny percentage of the total number of Green Cards issued by USCIS each year," said Rodriguez, adding that Green Cards are "highly tamper resistant." "Congress must continue its oversight of the Department of Homeland Security to ensure the integrity of our immigration system and improve the quality and efficiency of its services," said Sen. Ron Johnson, chairman of the Committee on Homeland Security and Governmental Affairs. "We must take concrete steps to remove any security gaps that can be exploited by terrorists and criminals. U.S. Citizenship and Immigration Services (USCIS) can assist such efforts by strengthening quality controls and its procedures to target lost, stolen or erroneously issued green cards." David Inserra, a policy analyst for homeland security and cyber security at the Heritage Foundation, told the Free Beacon that many of these problems can be blamed on USCIS’s Electronic Immigration System, or ELIS. "This program has already been running over time schedule, over budget, really falling short on all these things," Inserra explained. "It really speaks to a serious problem within USCIS." "The reality is those cards are out there and could be used for purposes they're not supposed to be used for," Inserra said, explaining that the ELIS system is failing to track errors. "There is a risk of these being misused, despite measures that might be taken to try and clean it up." UPDATE Nov. 29, 5:05 P.M.: This post has been updated to reflect comment from Sen. Johnson. UPDATE Nov. 30, 3:04 P.M.: This post has been updated with comment from USCIS Director Leon Rodriguez. This entry was posted in National Security and tagged Immigration. Bookmark the permalink.